this is an older piece and one of my more abstract. it has very high impasto and vibrant color. it’s based on a double vortex of fall leaves i once saw. this is my most recent large work. it has a high impasto and vibrant color. 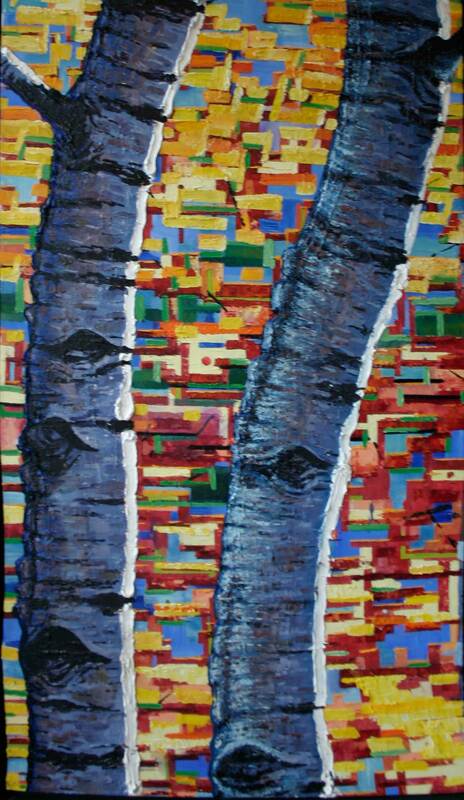 the stained glass effect of the background works particularly well against the very figurative birches. it looks great in any room. this is another recent piece done for jim c at vintage exotics http://www.vintageexotics.com/default.htm. different composition in this one. i like the rake of the car and how it seems to be hurtling towards the viewer through corner. it almost makes you feel like you need to hang on to something. 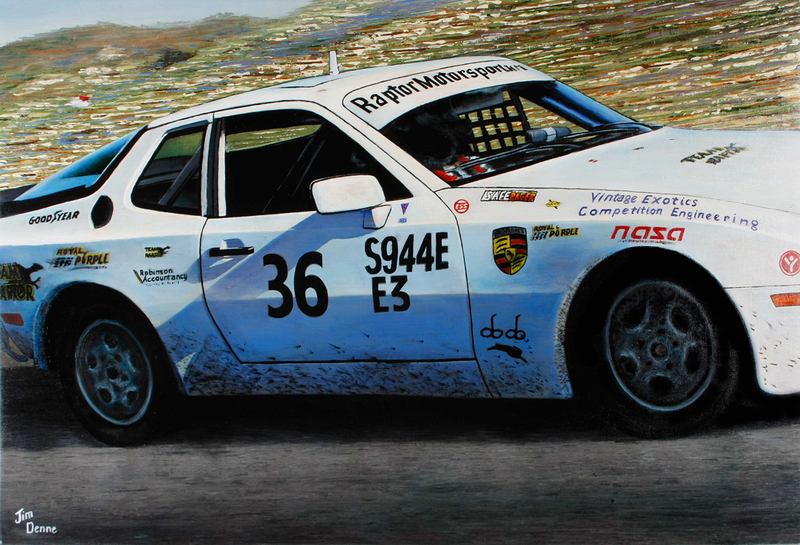 this is the most recent painting completed for jim c at http://vintageexotics.net/Vintage_Exotics/About.html. 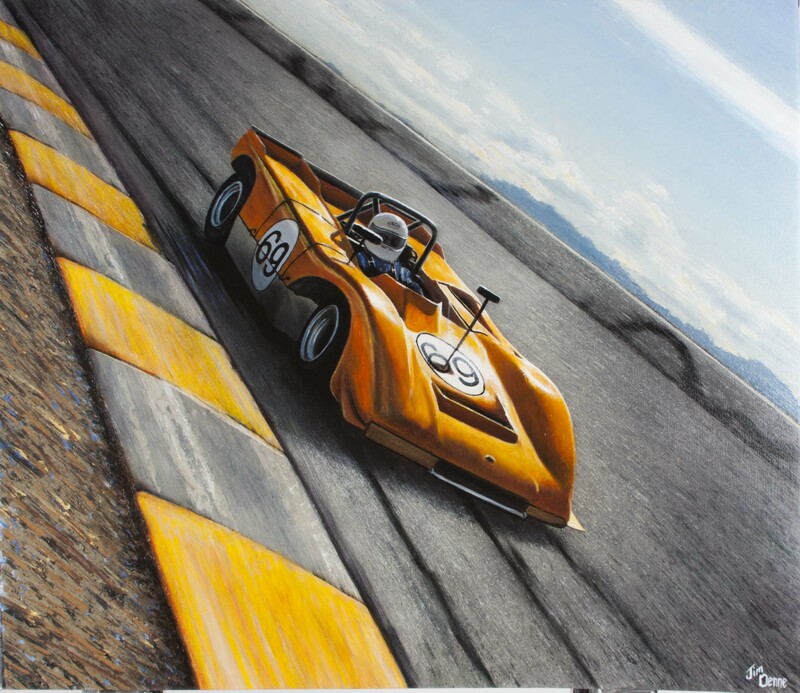 these paintings are based on photos that jim provides; they are of cars that jim has restored and races. it was a cool shot to work off of, as it gave me quite a lot of leeway to deal with the background. it also called into play my time painting signs, though on a much smaller scale. as a painting it works quite well. it kind of has the feeling of the end of an endurance race. which it was. this is another in the fall series of paintings i did several years ago. high impasto and vibrant color. i really like the way the solid forms of the trees play against the geometric, almost pixilated, abstraction of the background. this piece was donated to the hole in the woods art auction. i never did find out where it ended up, or what was paid for it. this is the second piece i did for ryan miller and cafe vero; this one for their albany location. again varied styles of, especially randomizing color fields. 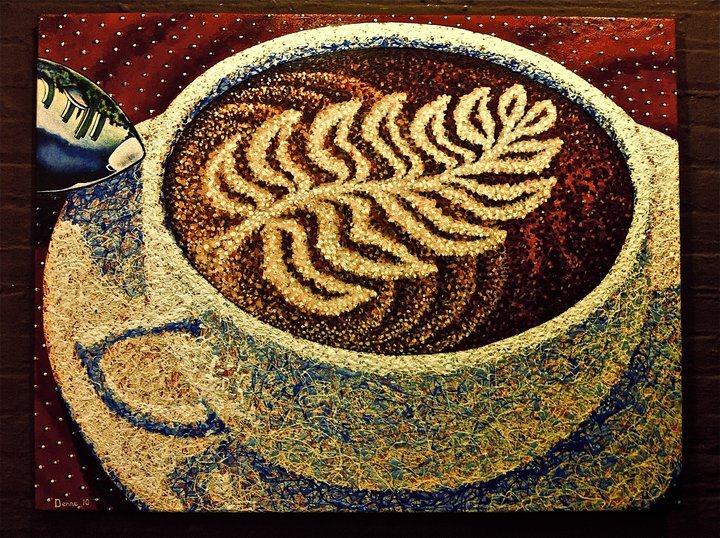 the drip painting of the cup works especially well, i think, against the kind of minimalist pointillism of the table cloth and exuberant pointillism of the coffee. the flat reflection of downtown albany in the spoon, acts as a signifier and creates a nice counterpoint to the texture of the rest of the piece. this large piece was commissioned by ryan miller for the cafe vero in lake george new york. i used a variety of techniques in this work. 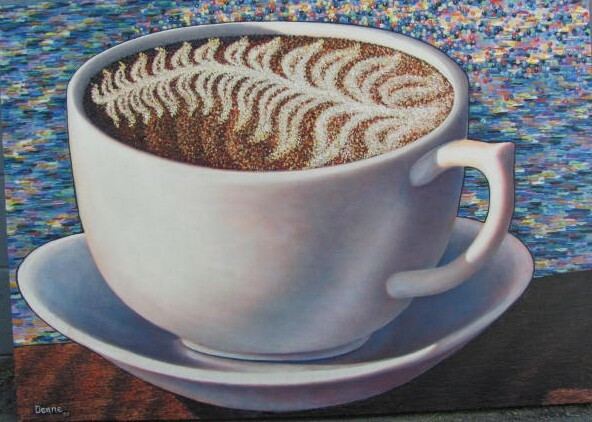 i used a high impasto pointillist approach for the coffee , smooth glazed surface for the cup, textured faux woodgrain for the table and a combination of bars and dots for the water. i often use various methods of representation or visual vocabularies in my work to develop contrast, harmony, and to direct the attention of the viewer. this large piece, done in high impasto, is part of a series i did which featured an almost stained glass like appearance. unfortunately, the photo does nor capture the sense of space and depth which this piece projects. when you stand in front of it you feel almost like you can walk into the scene.